Posted on December 6, 2018 by FRIENDS | Comments Off on There’s Still Time to Order Your Holiday Copy! A book that celebrates the soul of our community. 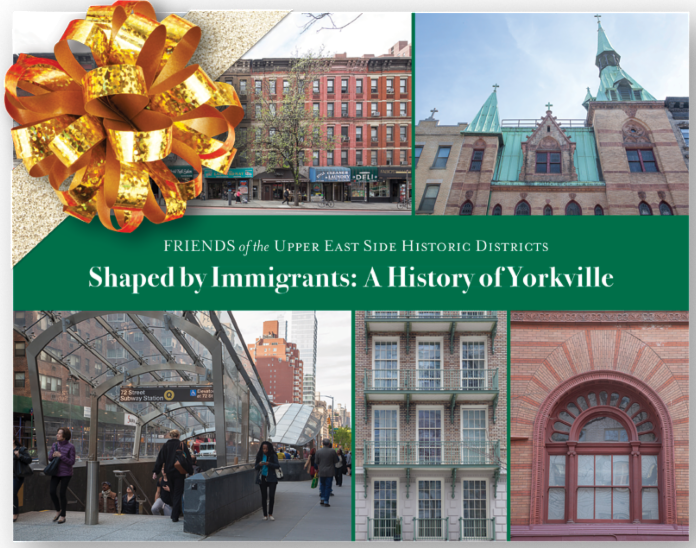 Shaped by Immigrants is a richly illustrated and engaging history of one of New York City’s most fascinating immigrant communities. Since the book’s release last month, we’ve been thrilled by its reception, including this glowing review by Douglas Feiden in Our Town. FRIENDS wants you to know that there is still time to place an order and have it delivered for the holidays. Proceeds from book sales directly support FRIENDS’ mission to preserve the architectural legacy, livability, and sense of place of the Upper East Side and be the leading voice for common sense development.